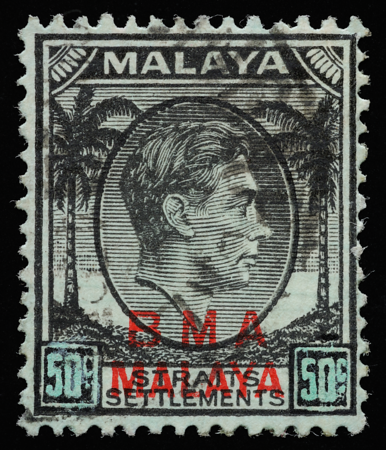 The BMA Malaya 50 cents (black on green paper) was famously forged by dyeing green the paper of the black 1c using some formula thought to have been derived from chlorophyll (Cockburn 2015) and altering the denomination tablets. The perpetrator was a Chinese employee in the post room of the National City Bank of New York in Singapore (Cockburn 1998, comm. 2017), who was eventually caught and jailed (Cockburn 2015). 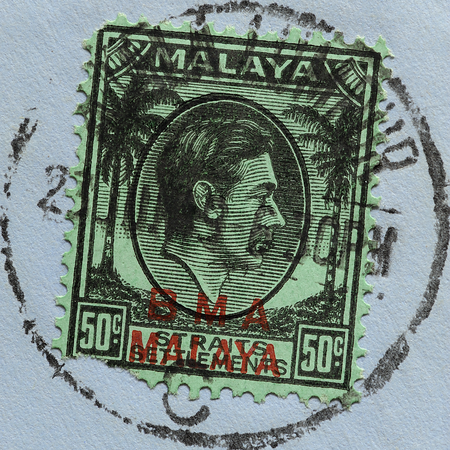 The forged stamps were used on parcels. They attained a sort of celebrity status and have been documented many times over the years—The Stamp Lover (1949), Fletcher (1977), Rosevear (1981), Cooper (1982, 1992), Cockburn (2015). Both green and black colouring matter were used, the former being almost turquoise in this instance. The outer frame of the tablet has also been reinforced with additional black. The original 1c inscription is invisible and evidently had been removed prior to drawing in the 50c. But traces of ink may have remained, necessitating the application of additional green colouring on the tablets to obscure them. See Lin & Cheah (2016a) for variations. 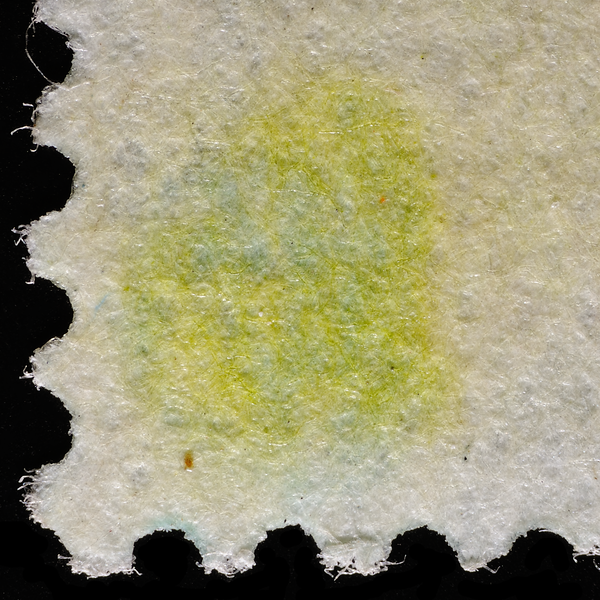 Occasionally, the tablet colouring permeates the paper as seen on the reverse of another example. The alteration of the tablets was a painstaking and, as it turns out, quasi-expressionistic endeavour. Yet the author knows of almost 30 forged stamps, including 14 on a single piece that auctioned for £8500 in 2016. This means he did it more than 50 times—twice on each stamp. The author has examined an example (Spink auction in Singapore, 28 October 2017) sporting much neater tablets than shown above but in similar "handwriting"—perhaps an early copy made before the forger ran low on endurance and patience, or a late copy after he had refined his materials and methods. The tablets' crudeness makes one wonder if the forger did not realize only until after the fact that evidence of his pranks would remain indelibly etched on the stamps and eventually bring about his downfall. 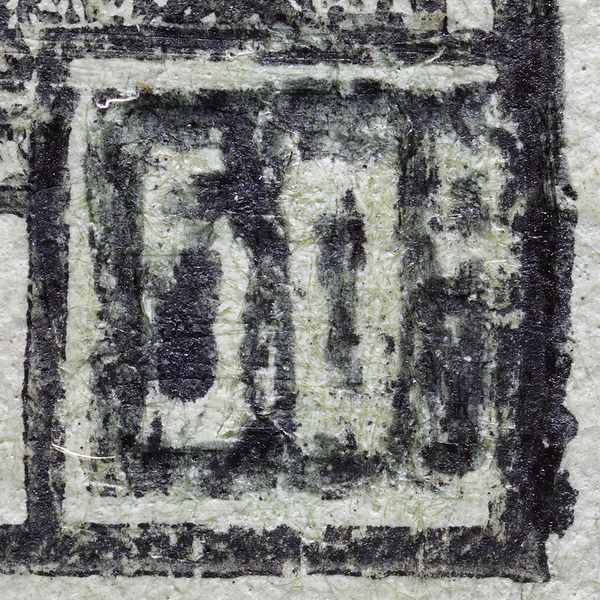 Almost all copies of the forgery seen by the author were fabricated from 1¢ stamps printed on striated paper (above), a characteristic first observed by Peter Cockburn. This dates the 1¢ to 1946 (see Cameron 1950). Lin & Cheah (2017), however, uncovered a single copy of what appears to be a fabrication on substitute paper. The typography of the tablets on the substitute paper is even cruder; the glyph shapes are indistinct while stroke thickness is inconsistent. Furthermore, the inscription "spills over" into the vertical white margin on the right-hand side of the tablet, which alludes to poor judgement of space constraints while working from left to right. Was this simply a case of the same forger having traction problems on substitute paper, or that of a contemporary forger inspired to produce his own forgeries, or a modern forgery of the forgery? No one knows. 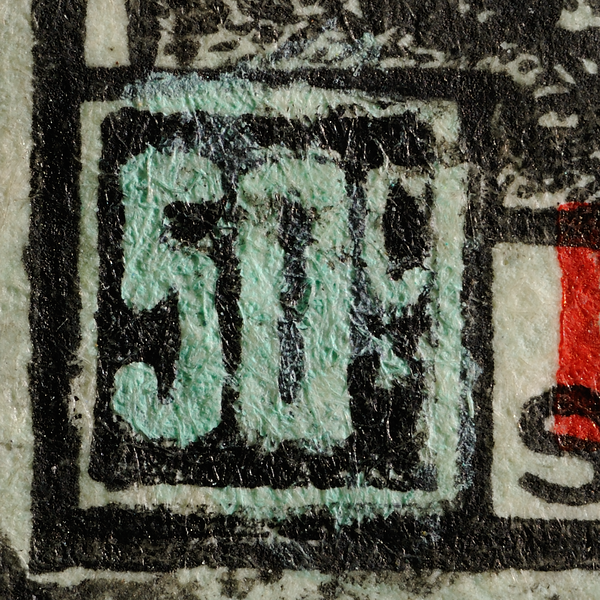 De La Rue had earlier suggested updating the 50c to a bicolour on white paper for post-war printings, but the Colonial Office rejected it (Cockburn 2015). Now it was too late. The forgery remains as much a maverick as ever. 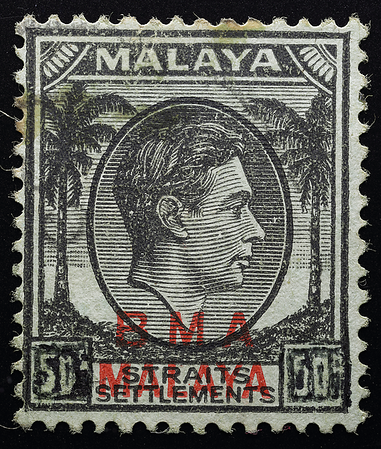 While some philatelists nostalgically recall the occasional copy lurking in flea markets for a few pence in days gone by, collectors nowadays face wildly fluctuating prices for the privilege of ownership. 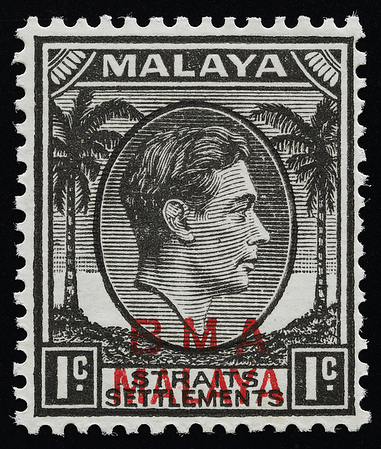 One told of a lucky strike for £1.99 on Ebay (Brown 2017b), while the author witnessed a bidding war for a single stamp at a major auction house in 2015 that escalated beyond S$5000.